The Days Ahead: Earnings again. ECB decision. One-Minute Summary: A roller coaster week. Stocks manage a 0.11% gain, which is the first weekly gain in four weeks. But it was hard won. We had a 1.5% gain, followed by a 1.8% correction but with late afternoon rallies every day. 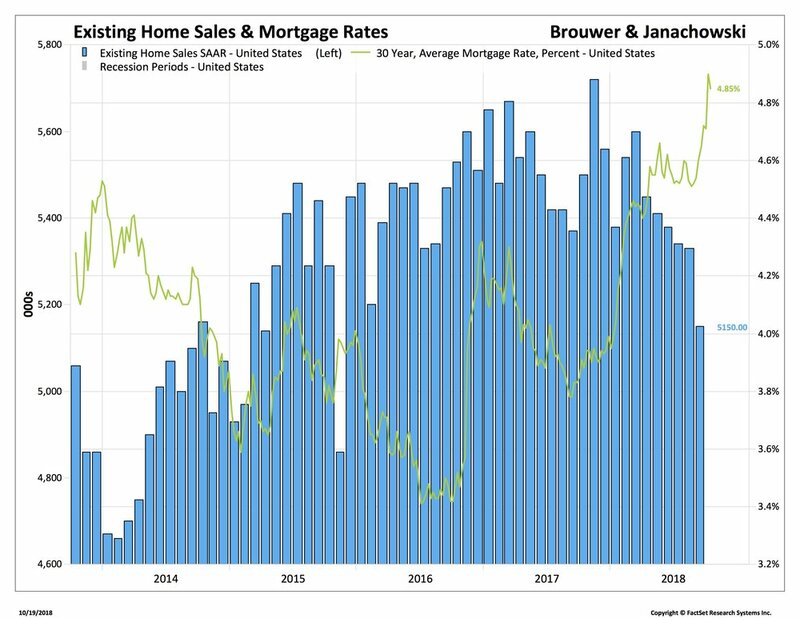 We think what’s happening is that we have the good news of earnings, jobs, inflation, China “not a currency manipulator” and the not-so-great news of the Fed, housing (see below) and retail sales. Throw in some geopolitical problems and the Italian budget and it's clear markets are nervous. If there was a market story this week, it was the usually dry as toast Fed minutes. All that happened was they said rates may have to rise above the longer run levels. Eh? That means simply that if they feel the longer term, equilibrium, neither-accommodative-nor-restrictive rate is, say 3%, then rates may have to rise to more than that to offset inflation or “financial imbalances” (which usually means asset-price inflation somewhere in the economy). That was enough to see rates spike for a day and leave the 10-Year Treasury yield up 5bps for the week. We're not too concerned. One, we feel rates may settle higher for a while as we go through a heavy refunding period and two, the Fed won't do anything rash. Elsewhere it was a heavy reporting week. Netflix showed good numbers, rallied and then lost it all. It’s pretty much the same price it was three months ago and, as a founding FANG member, reflects some disappointment in the tech story. The best sectors for the week were the classic defensive stock of utilities and consumer staples. Telecom used to be one of those sectors but is now the Communications Services sector with the likes of Google and Facebook…so is definitely no longer a defensive play. We've seen stellar earnings. About one-fifth of S&P 500 companies have reported with an average earnings gain of 19%. Stocks sell at 15.9x next year’s earnings, well below the five-year range. 1. How are the tax cuts coming? Fine if you pay corporation tax. For the average S&P 500 company, taxes fell from an average (very few paid the old top 35% rate) of 28% to 21%. Unlike credits or other fiscal stimulus, these dropped immediately to the bottom line and probably account for around half of the 20% annual increases in S&P 500 earnings we’re seeing now. It was meant to create jobs…but the momentum behind job growth hasn't really changed in the last year. Sure, it’s positive at around 180,000 a month this year but that’s only up from 175,000 in 2017. Wages, no…not much to see. Capex? Some. Buybacks? A lot. So it’s all fairly elusive until we get to the budget deficit and there it’s very clear indeed. Last Monday, the Treasury issued a presser on the deficit. It rose $113bn to $780bn in 2018 (the government fiscal year ends in September) or just under 4% of GDP, up from 3.6% in 2017. Here’s a slightly different way to look at it but you can see the trend. The bottom line shows the deficit as a % of GDP. It slopes sharply down from the beginning of 2018. The upper line is the unemployment rate. Normally these lines should be in sync. High employment, lots of tax revenues, low deficit. And when the economy enters recession, the government picks up the demand slack by increasing deficit spending. At the end of the go-go ‘90s, the budget was in surplus and unemployment roughly where it is today at around 4%. In the financial crisis, unemployment more than doubled and the deficit grew rapidly. And just as rapidly, it began to improve. Today’s number is the highest it's been in 70 years outside of a recession. The worry today is that we have a high and deteriorating deficit at almost full employment. Rates are going up. The net interest payable on the public debt is $332bn, making it the fourth largest budget item behind Social Security, Medicare and Defense. So more debt at higher rates will certainly put some pressure on public finances. There are even more revenue losses to come. Most expect the deficit to hit $1 trillion next year. And that assumes no recession or slow down. Some day, funding the deficit will be harder. We still like Treasury bonds, however, because most of the new issues are coming at the short end. There was even a brand new type of Treasury Bill issued last week. We now have a 2-month bill to join the 1-month, 3-month, 6-month and 12-month bills. That helps for now. But one way or another, the bill for those tax cuts will come due. 2. Housing market, all good? Well, not so much recently. The housing market is special in America. It’s the biggest beneficiary of middle-class tax breaks and the government spends a lot of money subsidizing and backing residential mortgages. We won't revisit the nightmare of 2007 but the housing market is showing some signs of a rollover. We look at housing starts, permits, refis, mortgage applications and new and existing home sales (six in all). One feature of the post-crash “start” market is that i) it’s still about 40% below its peak and ii) there are a lot more multi-units, up from around 20% of all starts to as high as 40% and now around 26%. That should mean more inventory and lower rents and may explain why that part (the OER) of the inflation index has been so low. ﻿And yet….last week we saw two key housing indicators flash red. Housing starts and permits were down. Starts are usually volatile…weather and labor shortages can affect the start process. Permits are not...you just file with the municipality and you're on your way. But those are down 10% this year. That's a big drop and the lowest number since 2015. What’s going on and should we worry? Mortgage rates are up sharply. The limits on tax deductibility have kicked in, especially in high price areas. Sales in the Northeast are down 20% this year. First-time buyers are holding back. Should we worry? No. Housing has peaked for this cycle. But it's not about to crash. A combination of sober lending standards, weak consumer recovery and slow wage growth have stopped the market from getting too far ahead of itself. Our best case is that the economy slows for the remainder of the year and the Fed does not ratchet up rates too aggressively in early 2019. Bottom Line: There is an end-of-year feel to the market. Some so-called crowded trades (i.e. there is lots of money in them) like Nasdaq and the dollar, have done well and we’d expect some profit taking. As last week, we would still look at protecting the portfolio where we can and are currently looking at Treasury FRNs.